The Kid killed his first man on August 17, 1877, during an argument over a card game. At this time he was again arrested and again escaped. The Kid next showed up in Lincoln County, New Mexico, and soon found employment at John Tunstall's ranch where he changed his name to William Bonney. At the time Lincoln County was controlled by a group of men known as the “House of Murphy.” The House of Murphy did not like John Turnstall and Alexander McSween's plan to open a bank and a mercantile store. This was because the plan was in direct conflict with the House of Murphy's holdings. Despite these hard feelings they decided to hire McSween to collect on a life insurance policy on one of their partners. McSween collected $10,000 on the policy and kept the money. Then the House sent Sheriff William Brady to collect McSween's cattle for payment, but when he arrived McSween told him that he had given the cattle to Turnstall. 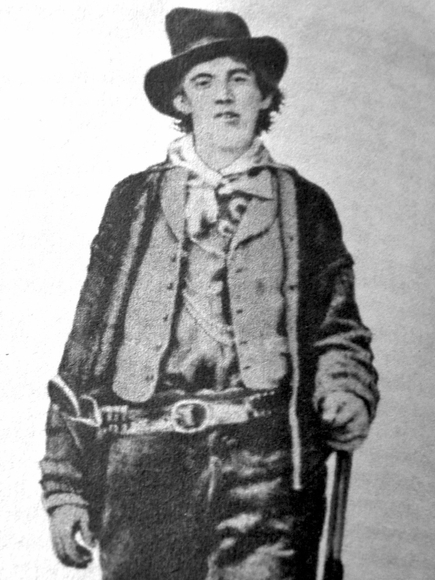 Turnstall was backed by his hired guns and they were led by Billy the Kid. Soon after the sheriff's deputies shot and killed Turnstall. Then just a month later, Sheriff Brady and his deputies were walking in front of the Turnstall mercantile when Billy and his hired guns killed the sheriff and one of his deputies. On July 14, McSween and the Kid, and 60 men swept into Lincoln County to seek revenge. During the first two days of fighting only a mule and a horse were hit. Then on the third day a sheriff's deputy was shot and later died. At this time Fort Stanton sent in an army force that was directed by Colonel N.A.M. Dudley. The army brought with them a Howitzer canon and a Gatling gun. The result was immediate, all but 14 McSween's men fled. McSween, his wife, and the remaining men took refuge in his home and the sheriff and the army set the house on fire. Everyone died except for Billy the Kid and a few of his companions. Soon afterward Billy was led to believe that he was going to receive an executive pardon so he gave himself up. However, he soon found out that the House of Murphy was going to have him prosecuted for murder so he again escaped from jail. In November of 1880, Pat Garrett was elected sheriff of Roswell, New Mexico. At this time he form a posse and headed to Fort Sumner to capture Billy the Kid. Billy was captured by Garrett, tried in Mesilla, New Mexico and sentenced to be hanged until death. The Kid was held in the Santa Fe, New Mexico jail where he was placed in solitary confinement. Someone hid a gun in the bathroom and Billy killed the deputy who was guarding him. Not long afterward, Garrett and his deputies heard that the Kid was hiding again in Fort Sumner. They were tipped off by Pete Maxwell who was jealous because the Kid was having affairs with the local girls. There in the dead of night Pat Garrett shot Billy dead through the heart.